A Cremation Bear is a touching gift and expression of love that will never end, bringing comfort to family members and close friends when they need it most. When we lose someone special, especially a baby or child, it hurts immensely that we cannot physically hold them and feel their closeness. 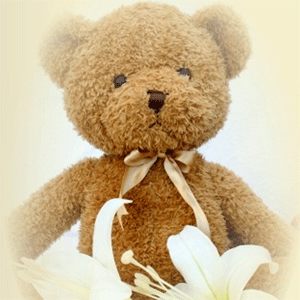 But a Personalised Memorial Keepsake such as a beautifully soft and cuddly Teddy Bear to hold your dear one's cremation ashes can help soothe the ache and bring some comfort from that deep hole in your heart as you journey through your grief. Our cremation bears are designed to hold a beautiful red heart securely in their chest, which you can fill with a small portion of cremation ashes, dried flowers or burial dirt, along with a treasured object such as a letter, lock of hair or item of jewellery. Names, dates and a personal message can be embroidered on to each paw of the bear, making your cremation bear a truly cherished and personalised memorial.